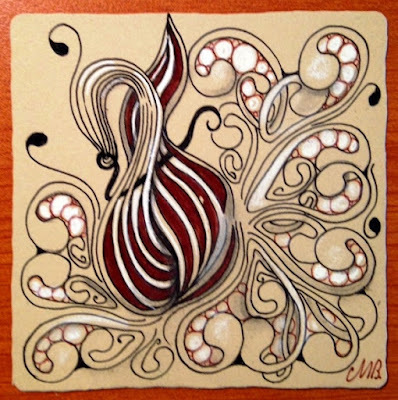 The Diva's Weekly Challenge #242: "New Official Tangle: Gourdgeous"
If you haven't seen this gorgeous new tangle from Maria check out the latest Zentangle newsletter here . This is a really striking piece. I like the dimensionality of it. Beautiful tile, Flux is great in it. I agree with Dorita about the dimensionality. I'm going to have another go at this tile and adopt your use of colour. Very gourgeous. Great colors. Beautiful. I love the balance of your tile! Beautiful tile, I love the effect of the white ! Absolutely gorgeous! Your Gourdgeous looks really wonderful! Wonderful shape! I love the color, the Gourdgeous, the Mookas, everything! I really like what you made of Gourdgeos! I'm not really sure I like this new tangle because it looks just not abstract enough for me.. ^^; And I honestly like the "original", Diva Dance, so much more. But that's why I prefer your "parted" version of Gourdgeous - this is more what I have in mind when I think of an original tangle pattern. Beautifully done! I love the pattern. Absolutely gorgeous! You have interpreted Gourdgeous beautifully here. I love how it is folded over upon itself. I love your Renaissance tiles! A beautiful tile with beautiful colors. Great! Your Gourdgeous is gourgeous! I love the color you have added and just the whole polished look of your tile. Love it!